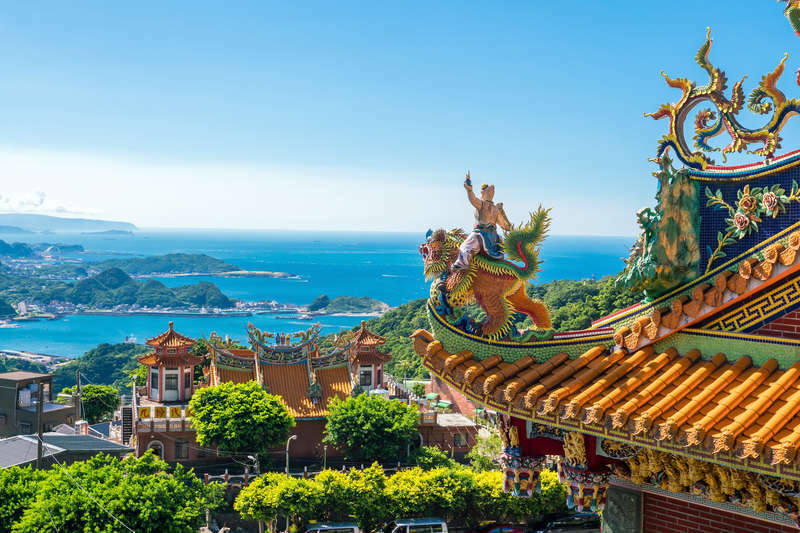 Yes, Taiwan is a wallet-friendly destination, but so is Southeast Asia at large. And while most travelers crowd into Thailand and Bali, this island sitting just off China’s eastern coast remains seriously overlooked. Amateur move, frankly. 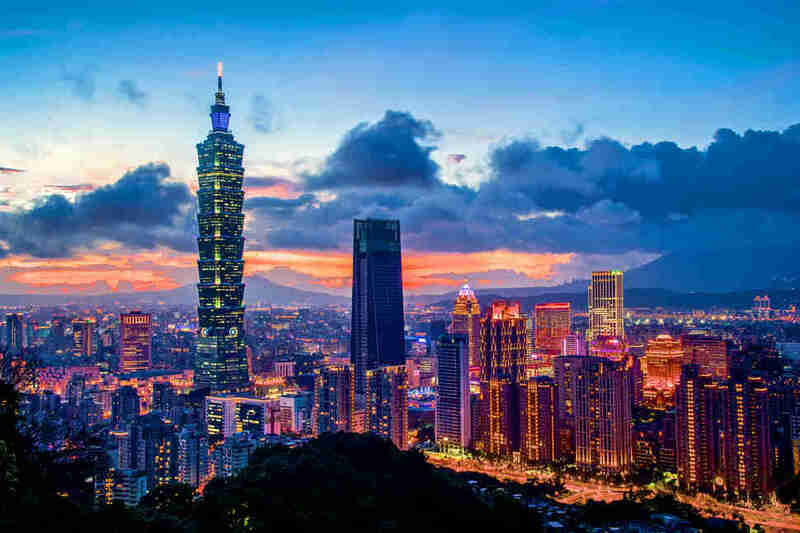 If you’re looking to boost your travel street cred, you need to put Taiwan on your hitlist. Think: A culinary scene defined by Michelin Stars and street food in equal measure. 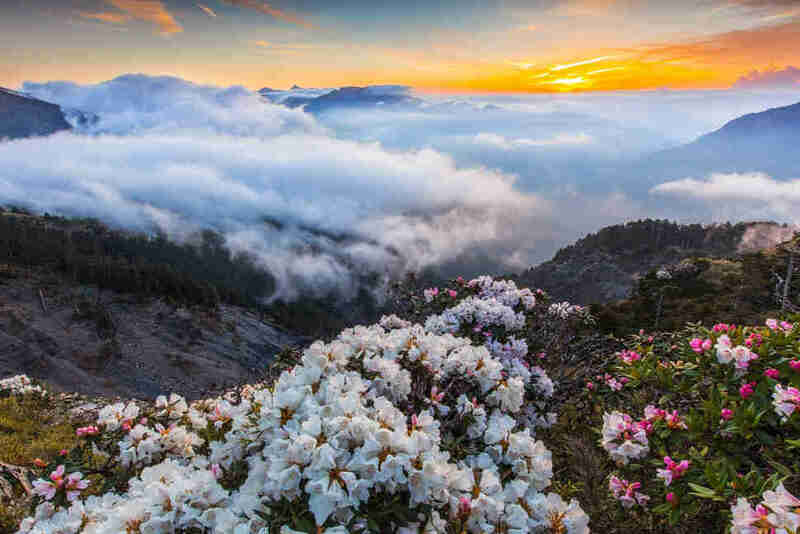 A geographical profile that ranges from mountainous to beachy with a whopping nine national parks. Locals who haven’t yet been burned out by an influx of tourists (the nation is regularly ranked among the friendliest countries in the world). If there’s a defining keyword here, it would be “opportunity.” To surf. To explore. 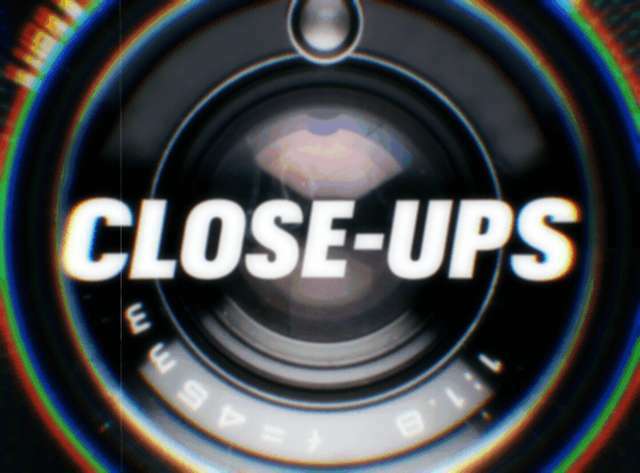 To experience a multi-faceted culture that hasn’t already been hashtagged to death. Of course, it also doesn’t hurt that Taiwan, from city to countryside, is straight-up beautiful. While no list is exhaustive, here’s a few of the island nation’s finest features to get you going. To the untrained eye, the sheer number of pagodas in Taiwan can be difficult to keep straight. 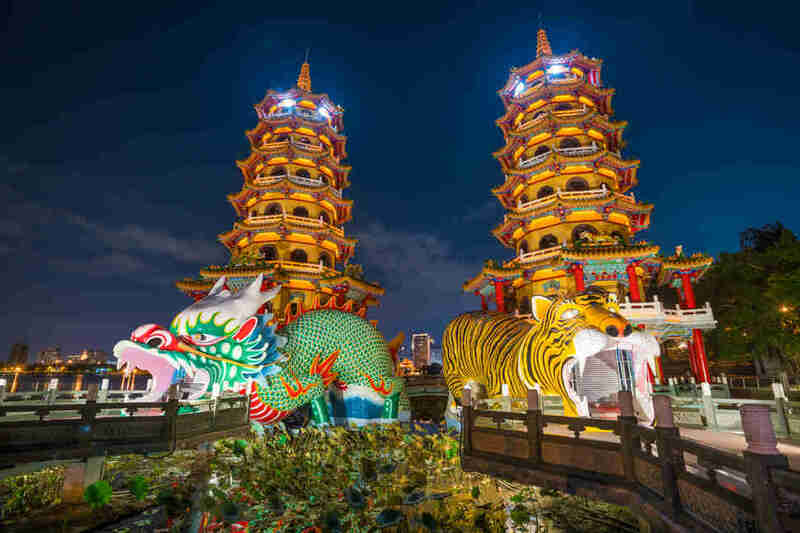 However, you’ll never forget a visit to the Dragon and Tiger Pagodas of Zuoying District, Kaohsiung. Situated on the banks of the man-made Lotus Pond, the staircases and walls of the twin seven-story towers depict stories about heaven and hell, among other prominent figures in local lore. Once inside, spiral staircases deposit you in an overlook above the lotus-covered water. Best practices suggest entering via the dragon’s mouth (dragons are a symbol of power and independence) and out the tiger (a symbol of courage and nobility) to maximize your good fortune. 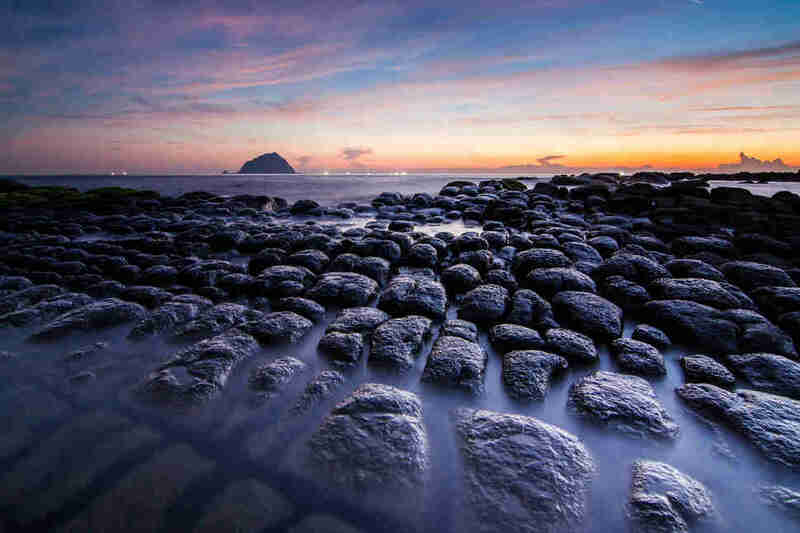 Take the Ho Ping Bridge (Taiwan’s first reinforced concrete bridge) to Ho Ping Island for a first-hand lesson at just how cool erosion can be. Here, the land is a series of jagged cliffs, rugged coastlines, and crazy-cool geological patterns. Pairs perfectly with an island sunset and romantic view. If Blade Runner was set in Taiwan, Taipei 101, the 10th tallest building in the world, would be where all the action takes place. Sure, you could skyrocket up to the observation deck on the 91st floor and be rewarded with crazy views of the city (at least on a clear day). But the real prize here is a view of the building itself. For the best vantage point, hike the nearby Elephant Mountain. Brace yourself -- those stairs are steep, but you’ll be well-rewarded for your effort with a sweeping sight of the futuristic district and Taiwan’s most iconic landmark. Located in Kaohsiung, Taiwan, the Fo Guang Shan Buddha Museum opened in 2011 as a home for one of the most prized relics in Buddhism, one of the Buddha’s teeth. 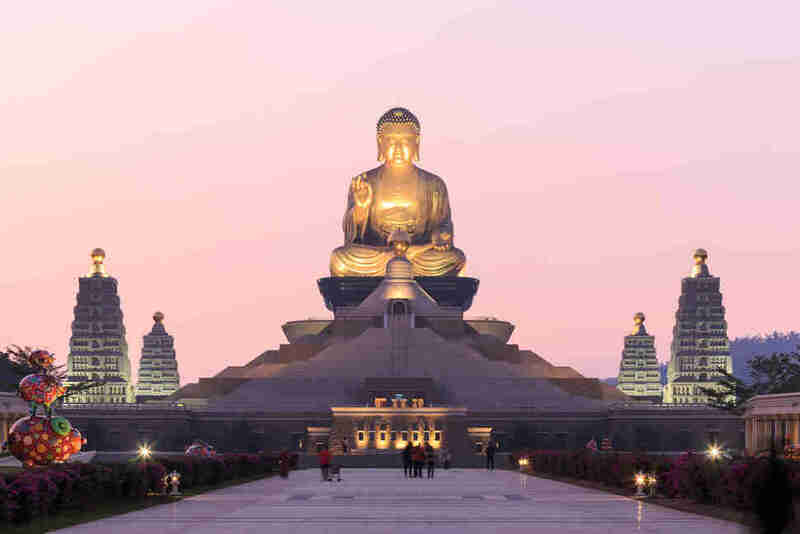 Open and free to everyone, its visually stunning grounds include one of the largest Buddha statues in Asia (seated on a black platform to look like it’s floating at night), and eight large, multi-story pagodas. Even for non-practitioners, walking the grounds is a calming (dare-we-say) zen-like experience. Spirited Away wasn’t a documentary, but you’d be forgiven for thinking so after visiting Jiufen, Hayao Miyazaki's inspiration for the iconic 2001 film. 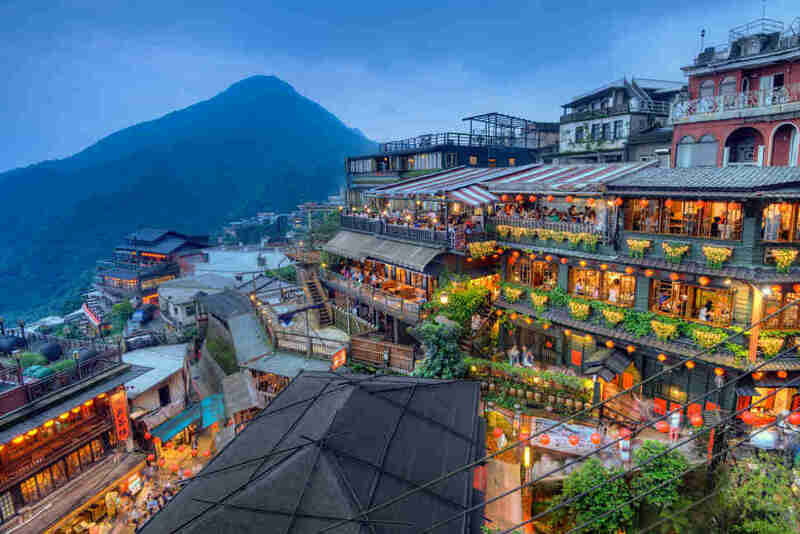 Along the Shuqi Road, the former gold rush town’s main drag, you’ll find colorful food stalls, red lanterns, and winding staircases that led Chihiro on her epic journey. 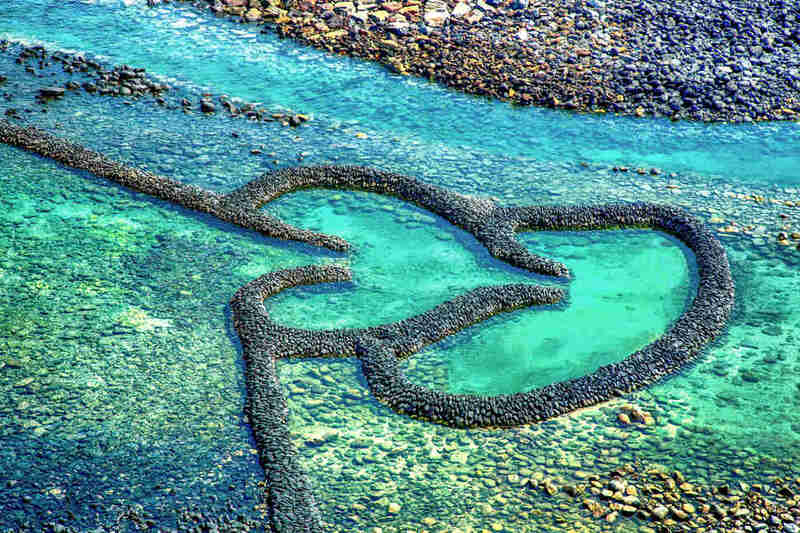 Located in Qimei Township, Penghu County, Taiwan, this sea barrier has a partial application as a well-preserved fishing trap. But be honest -- its swoops look like a set of double hearts. Framed by the turquoise water of the South China Sea, or a fiery sunset, it’s accidental art at its finest. Every year in February, shortly after Chinese New Year, Taiwan hosts the Lantern Festival, a two-week event celebrating traditional Taiwanese culture. 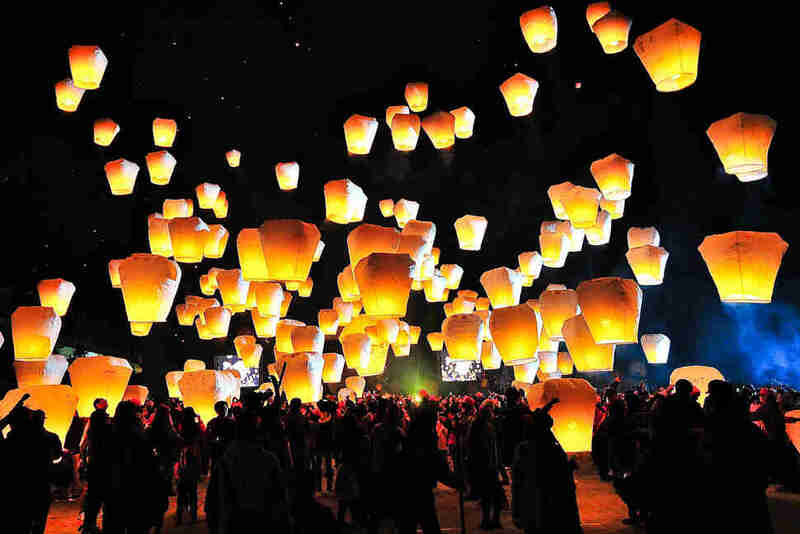 While its base of operations changes yearly, you can expect celebrations in the northern area of Pingxi to include traditional sky lanterns, while celebrations to the south feature thousands of land based-lanterns, representing everything from popular cartoon characters to elements of the Chinese zodiac. 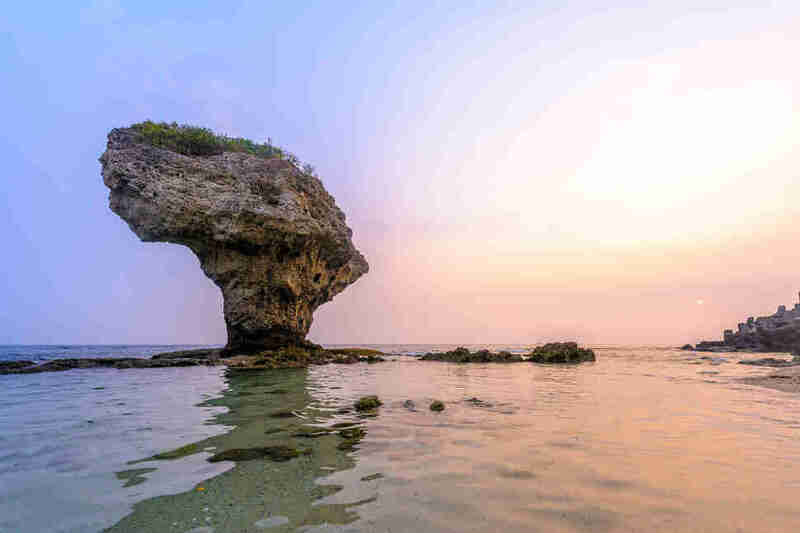 You’re going to want to visit this beach in the south of Taiwan for Flower Vase Rock, a large, floral-shaped outcropping just offshore. But if you’re eager for more geological adventuring, swing by Black Dwarf Cave after your swim. The limestone cave is thought to be haunted -- but even if you don’t spot a specter there’s always coal growths, scuttling crabs, and even an exhibition of wooden sculptures to enjoy. With its dramatically sharp cliffs and the emerald-colored water of Taroko Gorge, this national park gives you a true sense of Taiwan’s tropical side. And if the area’s abundant greenery leads you to cracking jokes about Jurassic Park, know that you’re not alone. Take in the breezes at Qingshui Cliff, or take in the bucolic scene at Eternal Spring Shrine, a memorial built over a waterfall dedicated to those who died during the local highway’s construction. This former veterans’ village in Taichung was once scheduled for demolition. 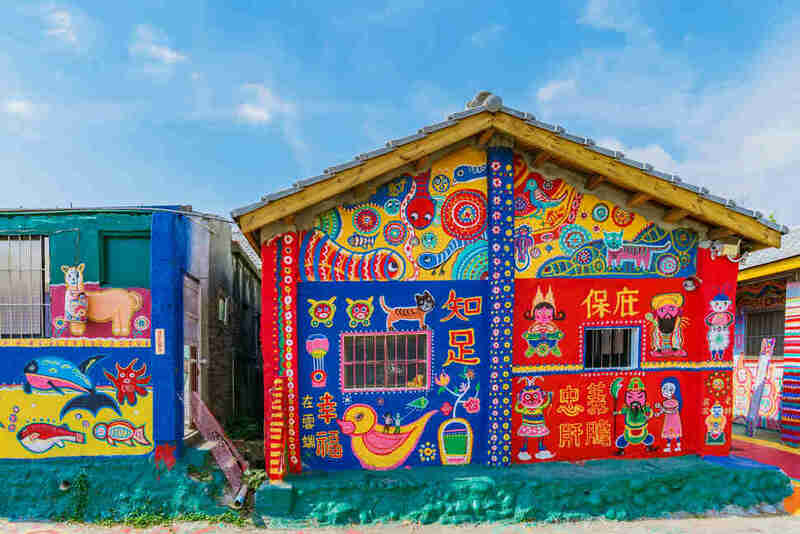 Its destiny was altered ten years ago by 96-year-old artist Huang Yung-Fu, who expanded his canvases to include roofs, walls and sidewalks, earning the remaining 11 houses the nickname “Rainbow Village,” and transforming the area into a travel destination for art lovers. If you’re lucky or enjoy getting up before dawn, you might even catch “Grandpa Rainbow” touching up his legion of surreal characters. Laura Studarus is a Thrillist contributor.